I wanted to add these two beasties. Hopefully I can convince a DM to at least let my character have the dog-croc as a familiar for my Genasi wizard, but it'd be stellar if I could convince one to let me have the kaprosuchus as a mount for my lizardman barbarian. BTW, if you're playing Tomb of Annihilation, both of these would be good encounters to add. The kaprosuchus is for pretty much any version of the game since I couldn't find 3.5/Pathfinder stats for giant crocodile. 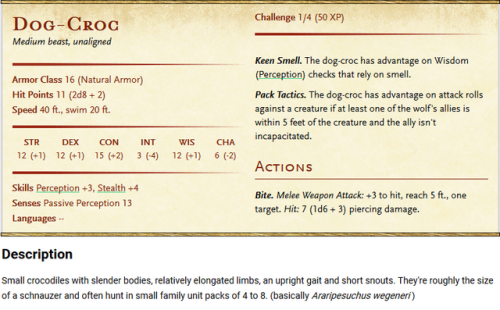 The above dogcroc is for 5e, and the one below is for 3.5 and pathfinder. The typos are fixed in the D&D Beyond entries. The pathfinder version is awaiting moderation. BTW, the pathfinder/3.5 version is different because the stats for the Riding Dog (and thusly Wolf) are different between those and 5e. Hey moderators, is there a way to merge this thread with the General D&D Pathfinder thread?